Heat oven to 350°F. Line cookie sheet with cooking parchment paper. Place loaf on cookie sheet; make three diagonal cuts with serrated knife. Bake 26 to 30 minutes or until browned. Meanwhile, spray 5-quart Dutch oven with cooking spray. 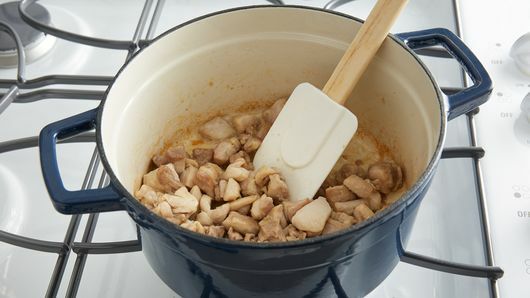 Cook chicken in Dutch oven over medium-high heat, stirring occasionally, about 6 minutes or until browned all over. Transfer to plate, and set aside. 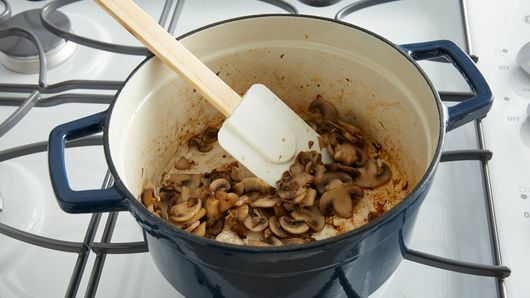 Add mushrooms to Dutch oven; cook 6 to 8 minutes, stirring occasionally, until deep brown. Heat rice as directed on pouch. 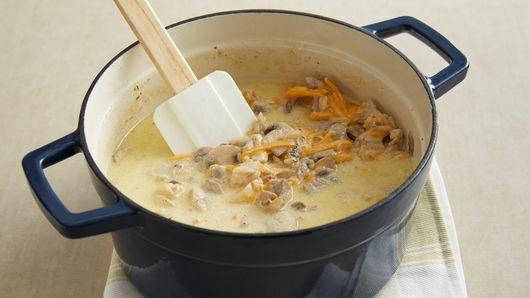 Add chicken, rice, half-and-half and broth to Dutch oven; heat to simmering. Reduce heat to low; cook 8 to 10 minutes or until chicken is no longer pink in center. Cover and keep warm over low heat while bread finishes baking. When bread is cool enough to handle, cut into 12 slices, and return to cookie sheet. Divide 1/2 cup of the cheese among the slices. 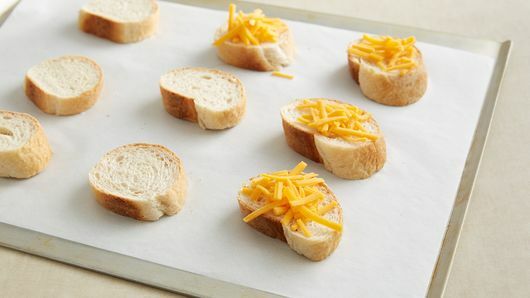 Bake 2 to 3 minutes or until cheese melts. 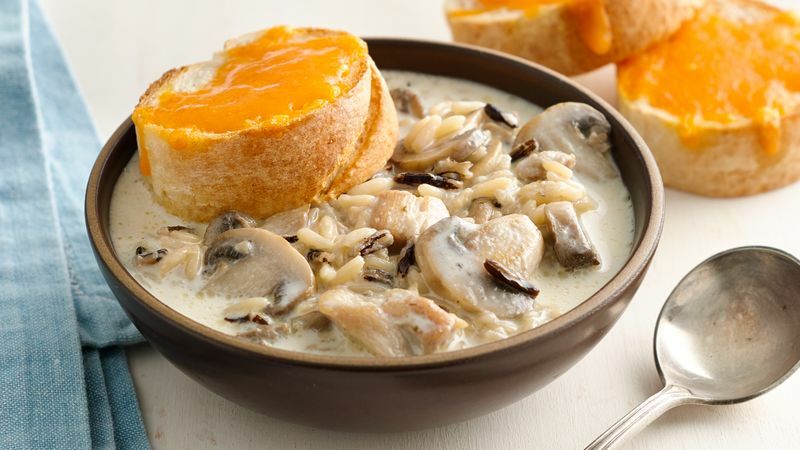 Remove soup from heat, and stir in remaining cheese until melted. Divide soup among 4 large bowls. Top each with 3 slices of the cheesy bread. 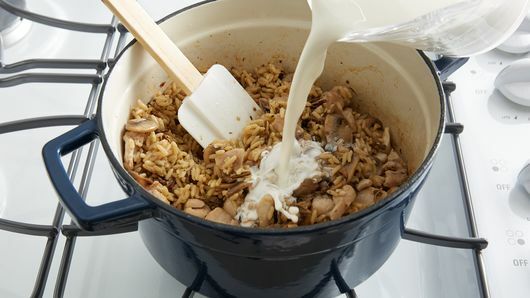 Swap in 1 1/2 cups cooked wild rice in place of the precooked, bagged rice. This recipe calls for half-and-half. Keep in mind that "fat-free" half-and-half is not the same thing!